Robin Williams' powerful performances and portrayal of iconic characters remain some of the most memorable in pop culture history. 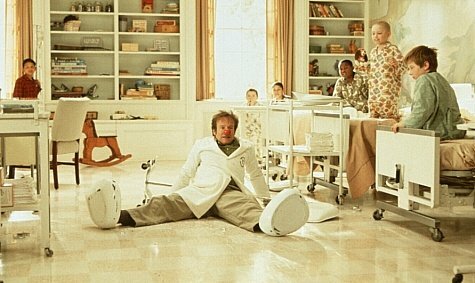 Despite his passing on Monday, proof of his many talents as an actor and comedian live on in films like Mrs. Doubtfire, Dead Poet's Society, Aladdin, and The Birdcage. Robin Williams enjoyed a wildly successful career in film, stand-up comedy, television, and voice-over acting, and his presence in the entertainment community will surely be missed by his friends and colleagues. Though he wasn't reported to have been using drugs at the time of his death by apparent suicide, Williams struggled with substance abuse and addiction for much of his life, which he hints at in some of his early, much edgier stand up comedy. And manages to make him laugh. "Excuse me Dr. Scholl, what wonderful foot pads!" This adorable moment could defrost the coldest of hearts.